Tel Aviv, Israel — June 9, 2016 … Lt. Col. Peter Lerner is the commander of the International Branch of the IDF Spokesperson’s Office. As he was heading home to Israel after leading an IDF delegation to Germany, his telephone started to vibrate with a river of incoming text messages. “I want to tell you about my night. It’s going to be in the news for a little while, and I want to remember it as it happened, not as the security camera footage shows. This is for me, but it’s also for you. Especially if you live in a place where these things barely make the news. I was supposed to stay on base all weekend and for the holiday, so I wanted a night out with Jordan. We settled on Benedict at Sarona, a 15-minute walk from our apartment. When we got there, they asked if we wanted a table outside or inside. It was hot, and we decided on inside, even if it meant waiting an extra couple of minutes for a table to clear out. We were seated by the wall, glass from ceiling to floor. It was nice. We sat, we ate. It was good. We heard this popping noise. At first, I thought it was an electrical problem. Then the screaming started, and the people running past our window. I saw a man. I do not remember the man, but I remember the gun held by the man. There was fire coming from the barrel, and it was red, and it made the gun even more silver. Because I had worked on a video about these weapons, I knew it was a Carlo Gustav rifle. I did not notice that he was wearing black and white. He was on the other side of the window, four feet away, separated by glass. 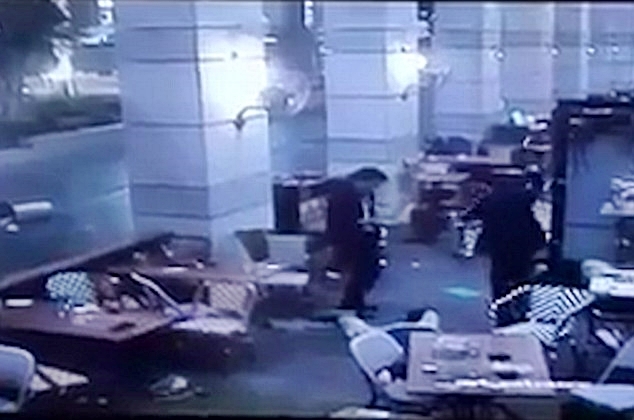 Very quickly, everyone at the restaurant either ran or fell to the ground. Jordan ran, I fell to the ground. You don’t coordinate these things. I lied there, facing away from the window. I really hoped he wouldn’t come into the restaurant or shoot at the glass wall. If he did, I would die. My breathing was steady, and I noticed that the floor was wet, which was unpleasant, but not, you know, the worst part. 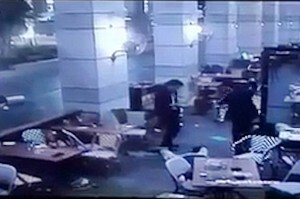 After the sounds of the shooting grew softer, someone from the restaurant shouted that we all need to run to the back in case they return, or enter the restaurant. I did. I ran, and I hoped he wasn’t still there outside, the gun and the man holding it. If he was, he could shoot me. The people in the back of the restaurant – everyone who had been in the restaurant – were staring at me, and I looked down and saw that I was covered in blood. I had fallen on my chin. It was my own. Jordan found me and cleaned off the blood. We hugged a lot. We told each other “I love you.” We called our families. I left a lot of voice messages. When the police and Magen David Adom (Israel’s Red Cross) gave us the all-clear, we started to leave. We were “in shock,” which we didn’t feel like we were, because shock is a very calm feeling, actually. They loaded us onto an ambulance. They took us to the hospital. A physician’s assistant took my vital signs. He had an Arab name. A doctor glued my chin back up, and they had us see a psychiatrist, who was very nice and made us laugh. I saw on TV that they’re handing out candies in Hebron. I’m scared to read the American headlines or any news at all. They kept playing the footage in the hospital waiting room. The terrorists are younger than me. They’re heroes back home. I’m thinking about all the “devil’s advocates” I’ve known, the “they have no other venues for protest” camp, the “it’s justifiable in a conflict like this” college students I shared desks with. Please consider, if you’ve read this far: if we hadn’t sat outside, if the shooters came into the restaurant, if one had turned slightly to the left and fired, I would be dead right now. I don’t care what “side” you’re on. I don’t care about your politics. If you care about me, call out terror for what it is. Call men shooting at screaming civilians who are running for their lives – terrorism. Tell the people you know that it’s never okay to target innocent men, women, and children, even if you don’t like where they live. Stand up for the people who didn’t want to wait, for the people who said “the weather is nice, let’s sit outside,” for the four people who will never come home again after tonight. Stand up for the workers, the parents, the grandparents, the friends, the off-duty soldiers who laid there on the floor and breathed softly, praying the glass would hold. Stand up to anyone who says my life isn’t worth it. Because when they say it, I’ve learned, they mean it.